Gilberto Febles of Gilberto Hair Center is Miami’s premier expert for hair extensions and hair replacement prothesis. A full service hair salon dedicated to making it’s customers feel young and beautiful. Please browse our website to find out more about the services we provide. Great hair takes care, and while caring for your hair should start at home, it’s also a great idea to get some professional love from a hair salon that knows what it’s doing. At Gilberto Hair Center in Miami, we have an advantage in Gilberto Febles. 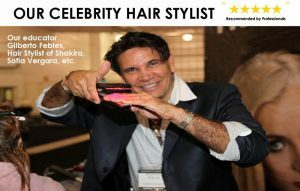 Gilberto has been a hair replacement and hair extensions specialist for over 35 years, and has even taught stylists from many world-renowned salons about his techniques and experiences. Whatever your hair needs might be, our full-service salon is here to serve you. Coloring: Whether you want natural or outrageous, we can help you achieve the tone or shade you desire. Perms: Get that perfect curl with a stylish perm from our professionals. Haircuts: Be it a quick trim or a drastic cut, we can help you achieve your desired hair length. Styling: Our professionals add some style to your ‘do, and we can offer tips on maintaining it at home. Keratin: If you struggle with frizzy hair, our keratin treatment might straighten things out. Many of the techniques and products used in our salon today were developed by the creative mind of Gilberto Febles himself. Trust your hair to a professional with over three decades of experience. Call Gilberto Hair Center today at 305-631-0360 to schedule your appointment. Gilberto Hair Center offers a variety of options for hair extensions in Miami. Strand by Strand, Weaving, Great Lengths, Hair Dreams, and African American Technique. We also specialize in state of the art custom hair replacement prosthesis for men, women, alopecia, and cancer patients. Offering an alternative to painful surgery. Gilberto Hair Center is a full service hair salon, hair replacement, and hair extensions facility. We also offer hair straightening with Brazilian Keratin. Visit our gallery see some of our amazing results and happy customers. We aim to please and provide the latest technology so you leave happy and feeling beautiful.